Their average age is 25, about 80% of them have a postgraduate degree including from IITs and IIMs, over one third are women and almost 70% have at least two years of work experience — meet the 475 ‘Zila Swachh Bharat Preraks’, provided by Tata Trusts for Prime Minister Narendra Modi’s signature Swachh Bharat Mission. Deployed in batches in rural districts since April 2017 to assist the district collectors, these young professionals on a fixed one-year-term contract have helped “bring energy and scale up the programme”, focusing on “behavioural change” to encourage people to use toilets, senior government officials involved in the Swachh Bharat Mission told ET. The Prime Minister earlier this week said 90% of the 8.7 crore toilets built in the country since 2014 under the mission were actually being used by people. Toilet coverage in India has touched 95% as on date. “This project of preraks is like a call to service. The professionals get experience of working with the government’s biggest programme. This idea is now being replicated in other government programmes too, like the POSHAN mission to make India malnutrition free,” an official said. 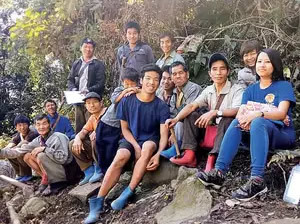 One such preraks is a 27-year-old lawyer who graduated from National Law College, Jodhpur University, Badapbiang T Dkhar, who worked in the remote Anjaw district of Arunachal Pradesh after quitting a high-paying job. She told ET how she has travelled long distances on foot to reach far-flung parts of her district for awareness generation. Anjaw, a district with just one petrol pump and one bank branch, was declared ODF in December last year. “The district collector was very supportive and we could execute many projects, including on toilets and menstrual health. I was driven by a sense of social service. This was a district where even newspapers do not reach, but we were able to convince people the importance of toilets,” she said. Alok Arunam, who did his Masters in engineering design from IIT-Madras, joined as a preraks in Rajasthan’s Nagaur district, which was declared ODF in August last year. Another youth, 27-year-old Minal Ingale, a post graduate in social work from TISS, Mumbai, joined Madhya Pradesh’s Chhindwara district that has gone ODF in March this year. The preraks have been trained in specific skills — like applying principles of data-driven management and using globally accepted tools for communication and community engagement to trigger behavioural change. A major task was to ensure that the data collected and uploaded on the central portal of Swachh Bharat (Grameen) were accurate. They were to ensure that all new toilets were geo-tagged and were expected to walk into the villages to tell people why a toilet was needed. Jeevan Roy, the preraks in Karnataka’s Dharwad district, is a 26-year-old engineer from NIE Mysore. He has done a threeday trip across nine villages last year and stayed with villagers to encourage them to adopt the scheme. The district went ODF in November 2017, within six months of Roy joining as the preraks there. The govt says this programme is a classic public-private partnership model. Tata Trusts selected and hired the young professionals and paid their salaries and allowances (about Rs 50,000 a month), while the government facilitated their placement in districts and coordination with states. “The salary they get is not high but the experience is invaluable for their career, both academically and professionally,” a government official said. As many as 529 out of India’s 640 districts have become ODF as on date, records show.